Fiji Road Authority (FRA) chief executive officer Jonathan Moore was on site yesterday for the commencement of the final coat sealing. Works are progressing well on the four lane road project on Kings Road, between the Rewa Bridge and Nine-Miles. 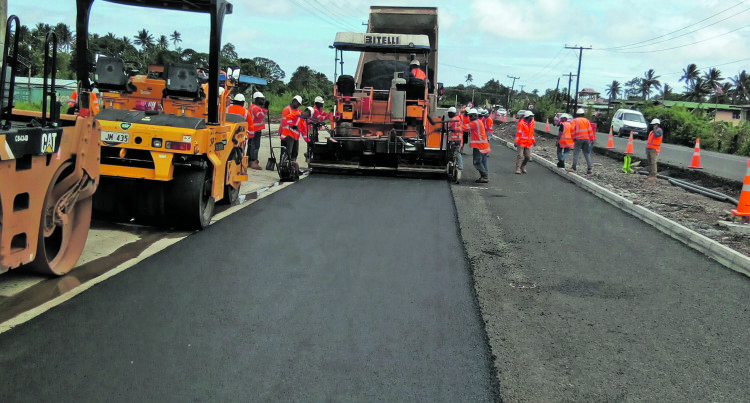 FRA will be carrying out road construction on the left-hand side on Kings Road from Nine miles to Rewa Bridge from Saturday February 2 to March 31. Works will be carried out on a 24-hour basis. During this time, FRA will be diverting both traffic on the right-hand side new carriage way. Mr Moore is advising road users to drive with extreme caution and be mindful of construction machinery and equipment that will be used for these road works. “Please factor in extra travel time in your journey, adhere to the speed limits and observe all road signs,” he said. Work on the 3.8-kilometre upgrade project is anticipated to be completed by June, if the weather permits.